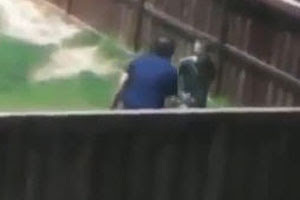 A US stepfather has been arrested after a neighbour allegedly filmed him beating his stepson after the boy dropped the ball while playing catch in their backyard. Anthony Sanchez, of California, handed himself in to police and was arrested on suspicion of felony child abuse on June 9 after the neighbour published the video on Facebook and Youtube before handing it in to authorities. The 34-year-old's neighbour Oscar Lopez allegedly secretly filmed the incident from inside his house, ABC News reports. Footage shows a young boy playing catch with a man in a backyard and dropping the ball, prompting the man to hit him with a belt. Eventually the man filming interrupts, yelling, "That's enough! I'm having a f---ing problem with you for beating the s—t out of him because he won't catch the ball". The man asks if the person filming knows his son, to which he replies: "I don't your son but I'm watching you. I'm a f---ing father too." Mr Sanchez, who is a director of a California water agency, has been bailed on $101,000. His lawyer acknowledged the video was disturbing but urged people to let police investigate before drawing conclusions. The man who filmed the incident said he was glad he did, saying "you don't have to be a police officer to stop something".